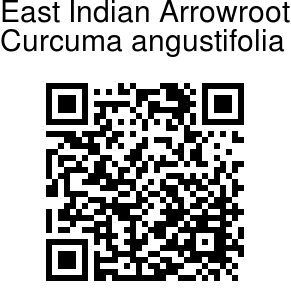 East Indian Arrowroot is an attractive ginger with stout underground rhizomes which lie dormant in winters. In early spring the flowers are produced before the leaves. Very colourful bracts make this a showy species. The shape and colour of the bracts are very variable. The inflorescence lasts in full bloom on the plants for about three weeks and more. Good for cut flower use with a vase life of 10 days and more for fresh cut blooms. Leaves grow to about 2ft tall and die down in autumn. This species is found in the Eastern Himalays and inhabits bright open hillsides and woods. 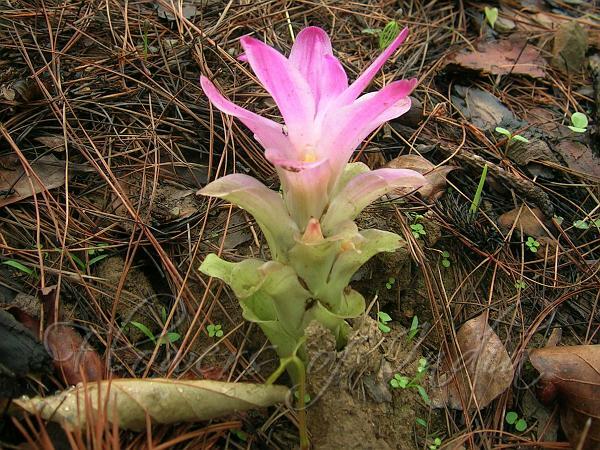 In Manipur, pakodas made using these flowers, are considered a delicacy. East Indian Arrowroot is found in the Himalayas, from Kumaon to NE India and SE Asia, at altitudes of 900-1210 m.
Medicinal uses: East Indian Arrowroot is recognized as a medical herb. It is nutritive, and is used as an agreeable, non-irritating diet in certain chronic diseases, during convalescence from fevers, in irritations of the alimentary canal, pulmonary organs, or of the urinary apparatus, and is well suited for infants to supply the place of breast-milk, or for a short time after having weaned them. It may be given in the form of jelly, variously seasoned with sugar, lemon-juice, fruit jellies, essences, or aromatics. Its jelly has no peculiar taste, and is less liable to become acid in the stomach, and is generally preferred by young infants to all others, except tapioca.